I just hosted a NetSurf Developer weekend which is an opportunity for us to meet up and make use of all the benefits of working together. We find the ability to plan work and discuss solutions without loosing the nuances of body language generally results in better outcomes for the project. Due to other commitments on our time the group has not been able to do more than basic maintenance activities in the last year which has resulted in the developer events becoming a time to catch up on maintenance rather than making progress on features. Because of this the July and November events last year did not feel terribly productive, there were discussions about what we should be doing and bugs considered but a distinct lack of commuted code. As can be seen from our notes this time was a refreshing change. We managed to complete a good number of tasks and actually add some features while still having discussions, addressing bugs and socialising. We opened on the Friday evening by creating a list of topics to look at over the following days and updating the wiki notes. We also reviewed the cross compiler toolchains which had been updated to include the most recent releases for things like openssl, curl etc. 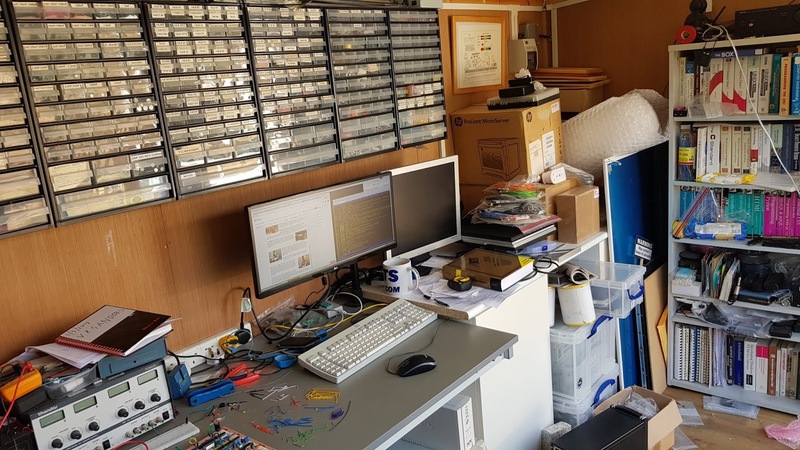 As part of this review we confirmed the decision to remove the Atari platform from active support as its toolchain builds have remained broken for over two years with no sign of any maintainer coming forward. While it is a little sad to see a platform be removed it has presented a burden on our strained resources by requiring us to maintain a CI worker with a very old OS using tooling that can no longer be replicated. The tooling issue means a developer cannot test changes locally before committing so testing changes that affected all frontends was difficult. Fixing a bug preventing compiling our reference counted string handling library. Fixing several bugs in the Framebuffer frontend installation. Making the Framebuffer UI use the configured language for resources. The main achievement of the day however was implementing automated system testing of the browser. This was a project started by Daniel some eight years ago but worked on by all of us so seeing it completed was a positive boost for the whole group. The implementation consisted of a frontend named monkey. This frontend to the browser takes textural commands to perform operations (i.e. open a window or navigate to a url) and generates results in a structured text format. Monkey is driven by a python program named monkeyfarmer which runs a test plan ensuring the results are as expected. We have combined the monkey tools and our test corpus into a CI job which runs the tests on every commit giving us assurance that the browser as a whole continues to operate correctly without regression. Now we just have the task of creating suitable plans for the remaining tests. Though I remain hazy as to why, we became inordinately amused by the naming scheme for the tools. We rounded the Saturday off by going out for a very pleasant meal with some mutual friends. Sunday started by adding a bunch of additional topics to consider and we made good progress addressing these. We performed a bug triage and managed to close several issues and commit to fixing a few more. We even managed to create a statement of work of things we would like to get done before the next meetup. 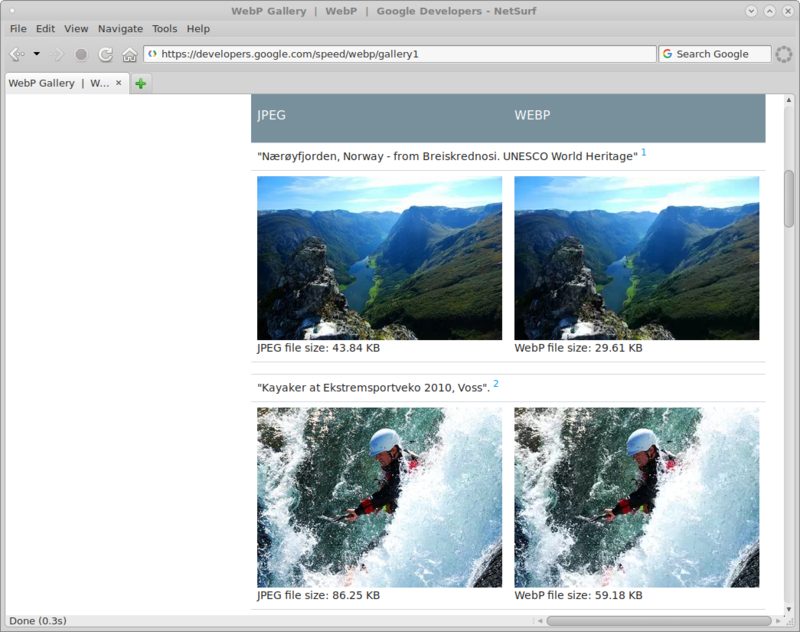 My main achievement on the Sunday was to add WEBP image support. This uses the Google libwebp library to do all the heavy lifting and adding a new image content handler to NetSurf is pretty straightforward. I was feeling a little under the weather last week and did not have enough concentration to work on developing a new NetSurf feature as I had planned. Instead I decided to look at a random bug from our worryingly large collection. 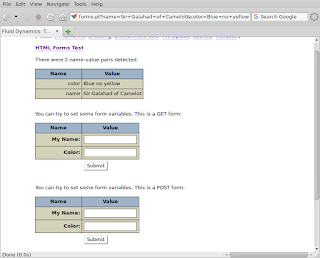 A user submits a form (by clicking a button or such) and the Document Object Model (DOM) is used to create a list of information in the web form. The list is then converted to the appropriate format for sending to the web site server. 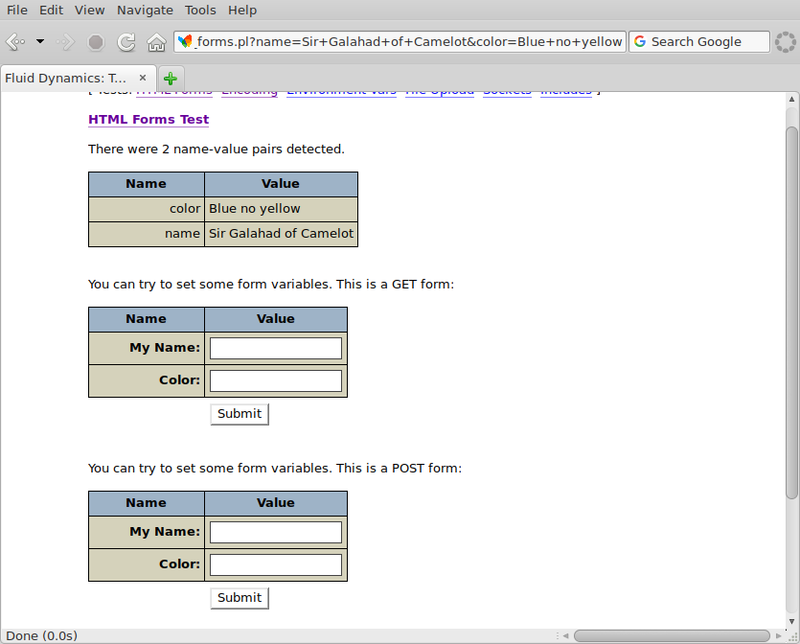 An HTTP request is made using the correctly formatted information to the web server. However the code I was faced with, while generally functional, was impenetrable having accreted over a long time. At this point I was forced into a diversion to fix up the core URL library handling of query strings (this is used when the form data is submitted as part of the requested URL) which was necessary to simplify some complicated string handling and make the implementation more compliant with the specification. My next step was to add some basic error reporting instead of warning the user the system was out of memory for every failure case which was making debugging somewhat challenging. I was beginning to think I had discovered a series of very hairy yaks although at least I was not trying to change a light bulb which can get very complicated. At this point I ran into the form_successful_controls_dom() function which performs step one of the process. This function had six hundred lines of code, hundreds of conditional branches 26 local variables and five levels of indentation in places. These properties combined resulted in a cyclomatic complexity metric of 252. For reference programmers generally try to keep a single function to no more than a hundred lines of code with as few local variables as possible resulting in a CCM of 20. I could abandon investigating the bug, because even if I could find the issue changing such a function without adequate testing is likely to introduce several more. I could refactor the function into multiple simpler pieces. I carefully examined the change in generated code and was pleased to see the compiler output had become more compact. This is an important point that less experienced programmers sometimes miss, if your source code is written such that a compiler can reason about it easily you often get much better results than the compact alternative. However even if the resulting code had been larger the improved source would have been worth it. After spending over ten hours working on this bug I have not resolved it yet, indeed one might suggest I have not even directly considered it yet! I wanted to use this to explain a little to users who have to wait a long time for their issues to get resolved (in any project not just NetSurf) just how much effort is sometimes involved in a simple bug. I fear that I may have worked in a similar office environment to Robert Frost. Certainly his description is familiar to those of us who have been subjected to modern "open plan" offices. Such settings may work for some types of job but for myself, as a programmer, it has a huge negative effect. You are on your own a lot of the time which means you must motivate yourself to work. Mainly this is achieved through a routine. I get dressed properly, start work the same time every day and ensure I take breaks at regular times. This is often more of a problem than you might expect and not in the way most managers assume. A good motivated software engineer can have a terrible habit of suddenly discovering it is long past when they should have finished work. It is important to be strict with yourself and finish at a set time. My previous office had "tired" furniture and decoration in an open plan which often had a negative impact on my productivity. 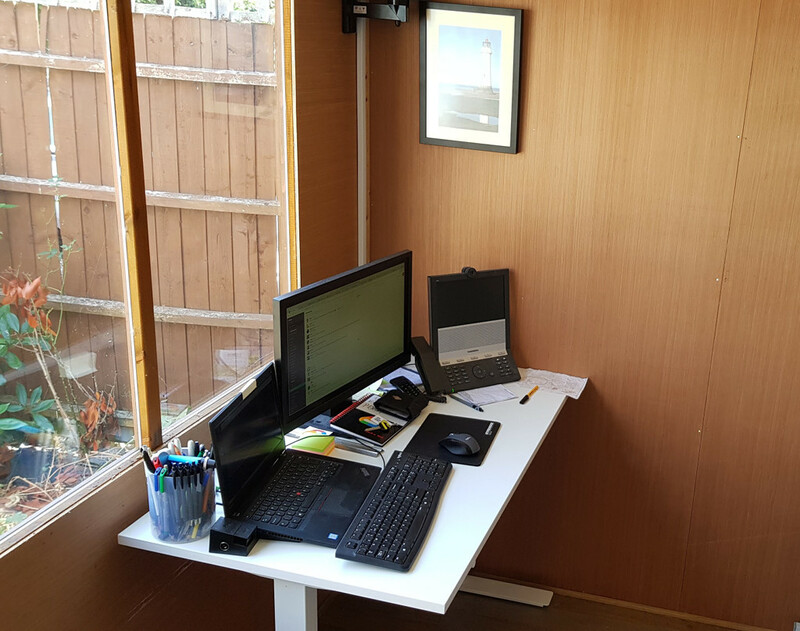 When working from home I find it beneficial to partition my working space from the rest of my life and ensure family know that when I am in that space I am unavailable. You inevitably end up spending a great deal of time in this workspace and it can have a surprisingly large effect on your productivity. Being confident I was aware of what I was letting myself into I knew I required a suitable place to work. In our previous home the only space available for my office was a four by ten foot cellar room with artificial lighting. Despite its size I was generally productive there as there were few distractions and the door let me "leave work" at the end of the day. This time my resources to create the space are larger and I wanted a place I would be comfortable to spend a lot of time in. Initially I considered using the spare bedroom which my wife was already using as a study. This was quickly discounted as it would be difficult to maintain the necessary separation of work and home. Instead we decided to replace the garden shed with a garden office. The contractor ensured the structure selected met all the local planning requirements while remaining within our budget. The actual construction was surprisingly rapid. 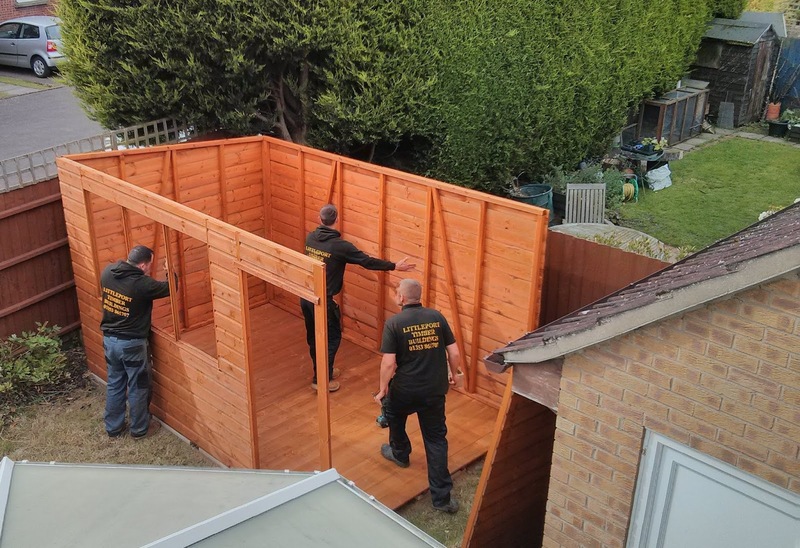 The previous structure was removed and a concrete slab base was placed in a few hours on one day and the timber building erected in an afternoon the next. The building arrived separated into large sections on a truck which the workmen assembled rapidly. They then installed wall insulation, glazing and roof coverings. I had chosen to have the interior finished in a hardwood plywood being hard wearing and easy to apply finish as required. Although the structure could have been painted at the factory Melodie and I applied this ourselves to keep the project in budget. 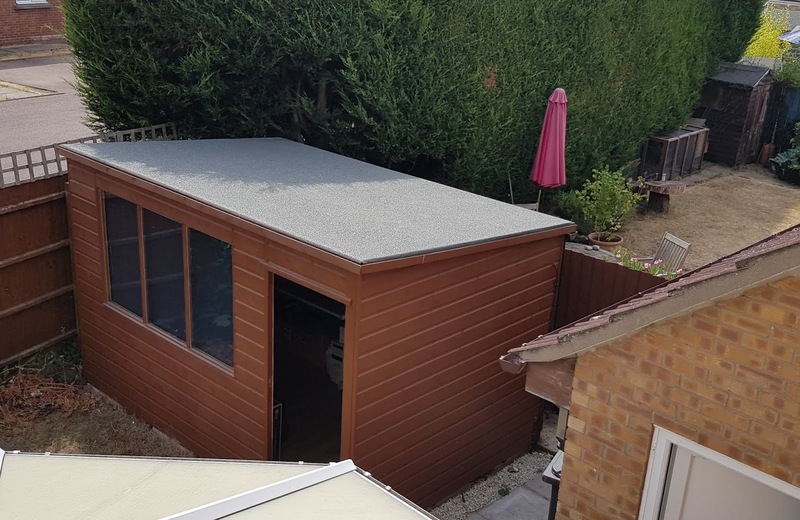 I laid a laminate floor suitable for high moisture areas (the UK is not generally known as a dry country) and Steve McIntyre and Andy Simpkins assisted me with various additional tasks to turn it into a usable space. To begin with I filled the space with furniture I already had, for example the desk was my old IKEA Jerker which I have had for over twenty years. Since then I have changed the layout a couple of times but have finally returned to having my work desk in the corner looking out over the garden. 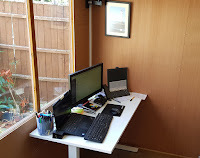 I replaced the Jerka with a new IKEA Skarsta standing desk, PEXIP bought me a nice work laptop and I acquired a nice print from Lesley Mitchell but overall little has changed in my professional work area in the last year and I have a comfortable environment. In addition the building is large enough that there is space for my electronics bench. The bench itself was given to me by Andy. I purchased some inexpensive kitchen cabinets and worktop (white is cheapest) to obtain a little more bench space and storage. Unfortunately all those flat surfaces seem to accumulate stuff at an alarming rate and it looks like I need a clear out again. 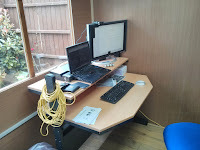 In conclusion I have a great work area which was created at a reasonable cost. Position the building better with respect to the boundary fence. I allowed too much distance on one side of the structure which has resulted in an unnecessary two foot wide strip of unusable space. Ensure the door was made from better materials. The first winter in the space showed that the door was a poor fit as it was not constructed to the same standard as the rest of the building. The door should have been positioned on the end wall instead of the front. Use of the building showed moving the door would make the internal space more flexible. Planned the layout more effectively ahead of time, ensuring I knew where services (electricity) would enter and where outlets would be placed. Ensure I have an electrician on site for the first fix so electrical cables could be run inside the walls instead of surface trunking. Budget for air conditioning as so far the building has needed heating in winter and cooling in summer. In essence my main observation is better planning of the details matters. If i had been more aware of this a year ago perhaps I would not not be budgeting to replace the door and fit air conditioning now. While Elizabeth Bibesco might well be right about the mind software cleanliness requires a different approach. Previously I have written about code smells which give a programmer hints where to clean up source code. 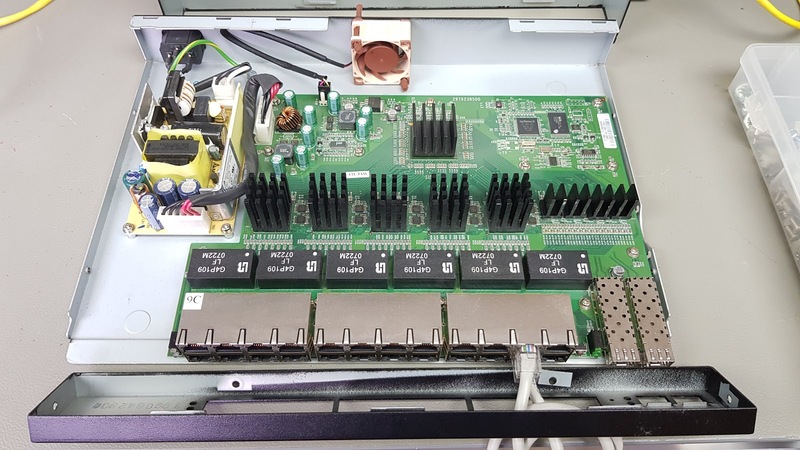 A different technique, which has recently become readily available, is using tool-chain based instrumentation to perform run time analysis. 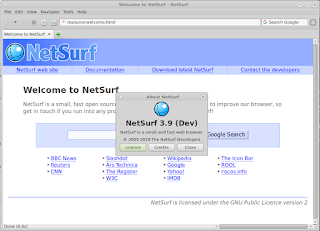 At a recent NetSurf developer weekend Michael Drake mentioned a talk he had seen at the Guadec conference which reference the use of sanitizers for improving the security and correctness of programs. This instrumentation detects several common errors when using memory such as "use after free"
As these are runtime checks it is necessary to actually execute the instrumented code. Fortunately most of the NetSurf components have good unit test coverage so Daniel Silverstone used this to add a build target which runs the tests with the sanitizer options. The previous investigation of this technology had been unproductive because of the immaturity of support in our CI infrastructure. This time the tool chain could be updated to be sufficiently robust to implement the technique. Jobs were then added to the CI system to build this new target for each component in a similar way to how the existing coverage reports are generated. This resulted in failed jobs for almost every component which we proceeded to correct. An example of how most issues were addressed is provided by Daniel fixing the bitmap library. Most of the fixes ensured correct type promotion in bit manipulation, however the address sanitizer did find a real out of bounds access when a malformed BMP header is processed. This is despite this library being run with a fuzzer and electric fence for many thousands of CPU hours previously. Although we did find a small number of real issues the majority of the fixes were to tests which failed to correctly clean up the resources they used. This seems to parallel what I observed with the other run time testing, like AFL and Valgrind, in that often the test environment has the largest impact on detected issues to begin with. In conclusion it appears that an instrumented build combined with our existing unit tests gives another tool to help us improve our code quality. Given the very low amount of engineering time the NetSurf project has available automated checks like these are a good way to help us avoid introducing issues. 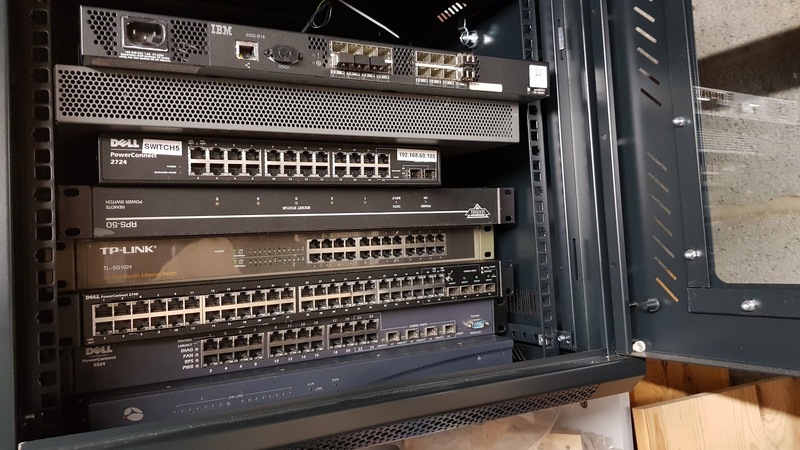 I needed a small Ethernet network switch in my office so went to my pile of devices and selected an old Dell PowerConnect 2724 from the stack. This seemed the best candidate as the others were intended for data centre use and known to be very noisy. I installed it into place and immediately ran into a problem, the switch was not quiet enough, in fact I could not concentrate at all with it turned on. 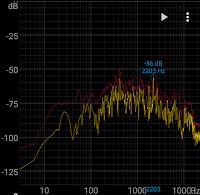 Believing I could not fix what I could not measure I decided to download an app for my phone that measured raw sound pressure. This would allow me to empirically examine what effects any changes to the switch made. The app is not calibrated so can only be used to examine relative changes so a reference level is required. I took a reading in the office with the switch turned off but all other equipment operating to obtain a baseline measurement. All measurements were made with the switch and phone in the same positions about a meter apart. The resulting yellow curves are the average for a thirty second sample period with the peak values in red. The peak between 50Hz and 500Hz initially surprised me but after researching how a human perceives sound it appears we must apply the equal loudness curve to correct the measurement. With this in mind we can concentrate on the data between 200Hz and 6000Hz as the part of the frequency spectrum with the most impact. 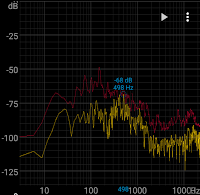 So in the reference sample we can see that the audio pressure is around the -105dB level. 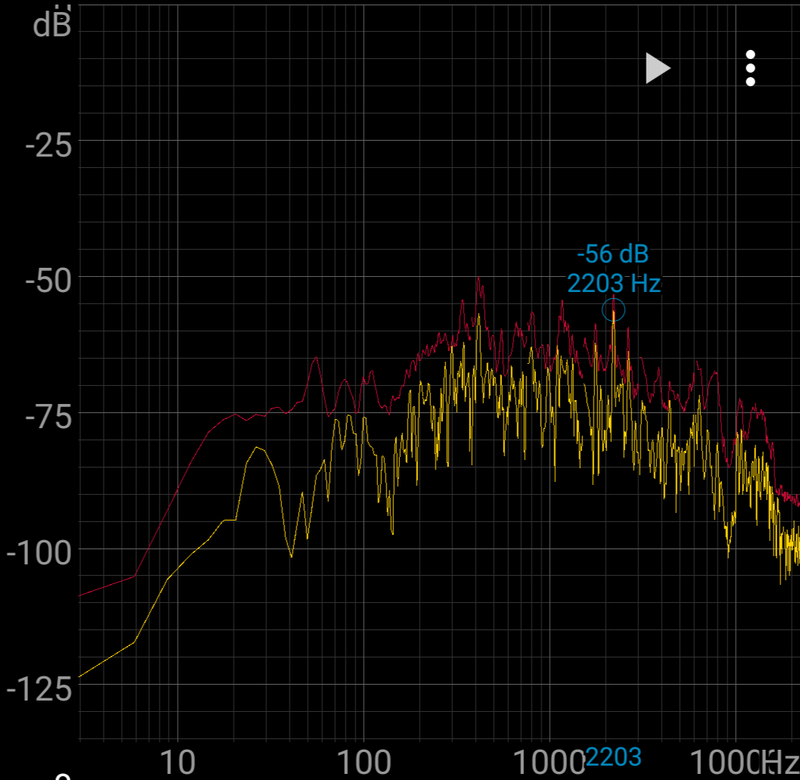 I turned the switch on and performed a second measurement which showed a level around the -75dB level with peaks at the -50dB level. 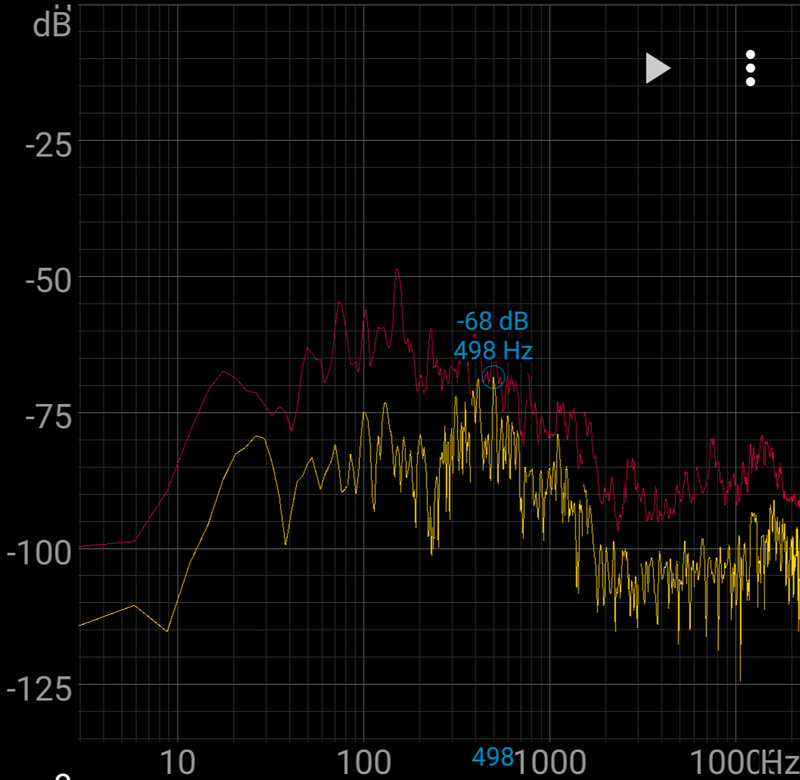 This is a difference of some 30dB, if we assume our reference is a "calm room" at 25dB(SPL) then the switch is causing the ambient noise level to similar to a "normal conversation" at 55dB(SPL). Something had to be done if I were to keep using this device so I opened the switch to examine the possible sources of noise. There was a single 40x40x20mm 5v high capacity sunon brand fan in the rear of the unit. I unplugged the fan and the noise level immediately returned to ambient indicating that all the noise was being produced by this single device, unfortunately the switch soon overheated without the cooling fan operating. I thought the fan might be defective so purchased a high quality "quiet" NF-A4x20 replacement from Noctua. The fan has rubber mounting fixings to further reduce noise and I was hopeful this would solve the issue. 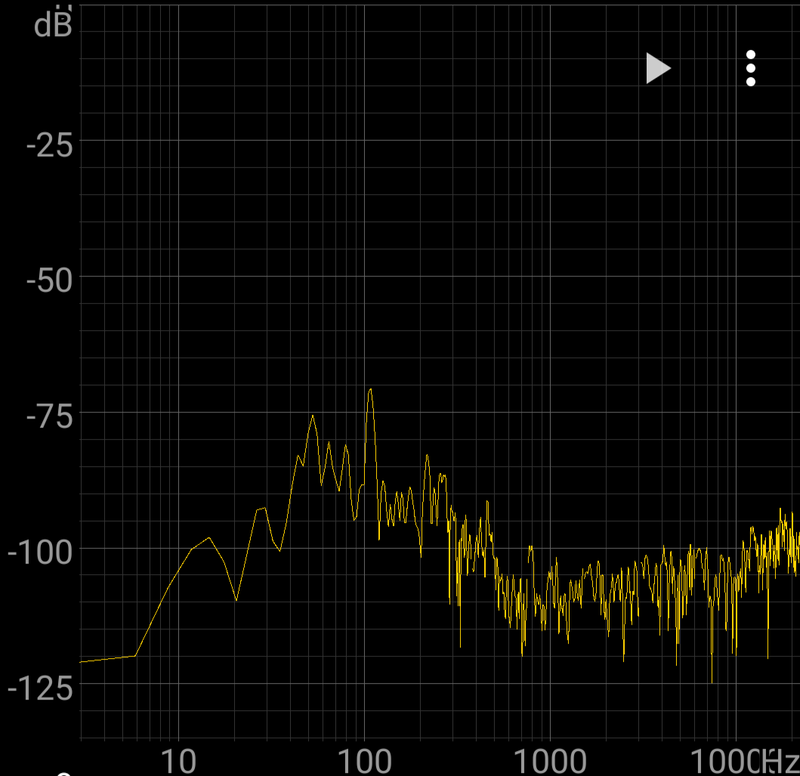 The initial results were promising with noise above 2000Hz largely being eliminated. However the way the switch enclosure was designed caused airflow to make sound which produce a level around 40dB(SPL) between 200Hz and 2000Hz. The management interface was dreadful to use. The network performance was not very good especially in trunk mode. The lower frequency noise became a distraction for me in an otherwise quiet office. In the end I purchased an 8 port zyxel switch which is passively cooled and otherwise silent in operation and has none of the other drawbacks. Higher frequency noise (2000Hz and above) is much more difficult to ignore than other types of noise. As I have become older my tolerance for equipment noise has decreased and it actively affects my concentration levels. Some equipment has a design which means its audio performance cannot be improved sufficiently. 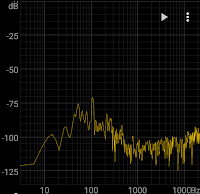 Measuring and interpreting noise sources is quite difficult. Often I end up dealing with code that works but might not be of the highest quality. While quality is subjective I like to use the idea of "code smell" to convey what I mean, these are a list of indicators that, in total, help to identify code that might benefit from some improvement. I am most certainly not alone in using this approach and Fowler et al have covered this subject in the literature much better than I can here. One point I will raise though is some programmers dismiss code that exhibits these traits as "legacy" and immediately suggest a fresh implementation. There are varying opinions on when a rewrite is the appropriate solution from never to always but in my experience making the old working code smell nice is almost always less effort and risk than a re-write. When I come across smelly code, and I decide it is worthwhile improving it, I often discover the biggest smell is lack of test coverage. Now do remember this is just one code smell and on its own might not be indicative, my experience is smelly code seldom has effective test coverage while fresh code often does. Test coverage is generally understood to be the percentage of source code lines and decision paths used when instrumented code is exercised by a set of tests. Like many metrics developer tools produce, "coverage percentage" is often misused by managers as a proxy for code quality. Both Fowler and Marick have written about this but sufficient to say that for a developer test coverage is a useful tool but should not be misapplied. Although refactoring without tests is possible the chances for unintended consequences are proportionally higher. I often approach such a refactor by enumerating all the callers and constructing a description of the used interface beforehand and check that that interface is not broken by the refactor. At which point is is probably worth writing a unit test to automate the checks. Because of this I have changed my approach to such refactoring to start by ensuring there is at least basic API code coverage. This may not yield the fashionable 85% coverage target but is useful and may be extended later if desired. It is widely known and equally widely ignored that for maximum effectiveness unit tests must be run frequently and developers take action to rectify failures promptly. A test that is not being run or acted upon is a waste of resources both to implement and maintain which might be better spent elsewhere. For projects I contribute to frequently I try to ensure that the CI system is running the coverage target, and hence the unit tests, which automatically ensures any test breaking changes will be highlighted promptly. I believe the slight extra overhead of executing the instrumented tests is repaid by having the coverage metrics available to the developers to aid in spotting areas with inadequate tests. A short example will help illustrate my point. When a web browser receives an object over HTTP the server can supply a MIME type in a content-type header that helps the browser interpret the resource. However this meta-data is often problematic (sorry that should read "a misleading lie") so the actual content must be examined to get a better answer for the user. This is known as mime sniffing and of course there is a living specification. The git log shows the code has not been significantly updated since its implementation in 2011 but the spec has. While some of these are obvious the non-use of the global string table and the API complexity needed detailed knowledge of the codebase, just to highlight how subjective the sniff test can be. There is also one huge air freshener in all of this which definitely comes from experience and that is the modules author. Their name at the top of this would ordinarily be cause for me to move on, but I needed an example! This immediately shows me that this API is used in only a very small area, this is often not the case but the general approach still applies. After a little investigation the usage is effectively that the mimesniff_init API must be called before the mimesniff_compute_effective_type API and the mimesniff_fini releases the initialised resources. A simple test case was added to cover the API, this exercised the behaviour both when the init was called before the computation and not. Also some simple tests for a limited number of well behaved inputs. By changing to using the global string table the initialisation and finalisation API can be removed altogether along with a large amount of global context and pre-processor macros. This single change removes a lot of smell from the module and raises test coverage both because the global string table already has good coverage and because there are now many fewer lines and conditionals to check in the mimesniff module. examined using a fuzzer to get a better test corpus. updated the implementation to 2017 specification. The approach examined here reduce the smell of code in an incremental, testable way to improve the codebase going forward. This is mainly necessary on larger complex codebases where technical debt and bit-rot are real issues that can quickly overwhelm a codebase if not kept in check. This technique is subjective but helps a programmer to quantify and examine a piece of code in a structured fashion. However it is only a tool and should not be over applied nor used as a metric to proxy for code quality. Deng Xiaoping (who succeeded Mao) expounded this view and obviously did not depend on a minority to succeed. In open source software projects we often find ourselves implementing features of interest to a minority of users to keep our software relevant to a larger audience. 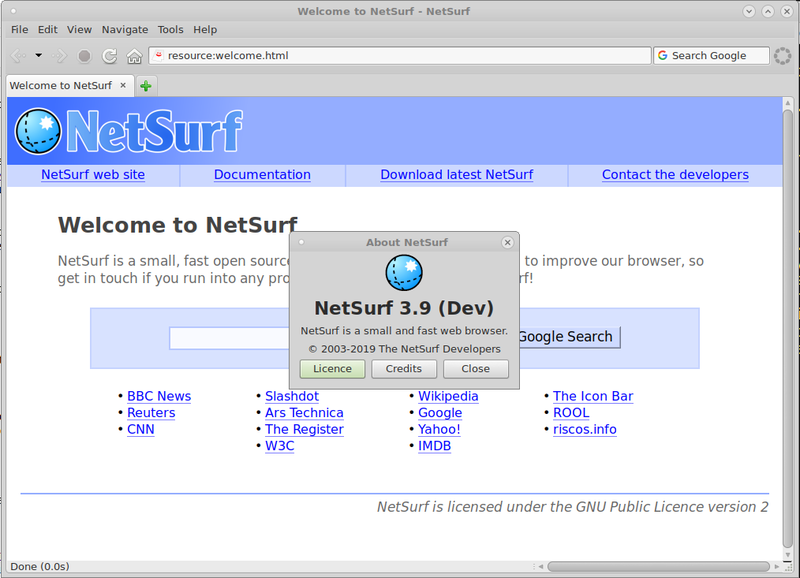 As previously mentioned I contribute to the NetSurf project and the browser natively supports numerous toolkits for numerous platforms. This produces many challenges in development to obtain the benefits of a more diverse user base. As part of the recent NetSurf developer weekend we took the opportunity to review all the frontends to make a decision on their future sustainability. Each of the nine frontend toolkits were reviewed in turn and the results of that discussion published. This task was greatly eased because we we able to hold the discussion face to face, over time I have come to the conclusion some tasks in open source projects greatly benefit from this form of interaction. Coding and day to day discussions around it can be easily accommodated va IRC and email. Decisions affecting a large area of code are much easier with the subtleties of direct interpersonal communication. An example of this is our decision to abandon the cocoa frontend (toolkit used on Mac OS X) against that to keep the windows frontend. 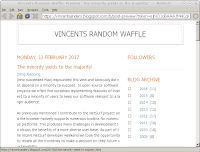 The cocoa frontend was implemented by Sven Weidauer in 2011, unfortunately Sven did not continue contributing to this frontend afterwards and it has become the responsibility of the core team to maintain. Because NetSuf has a comprehensive CI system that compiles the master branch on every commit any changes that negatively affected the cocoa frontend were immediately obvious. Thus issues with the compilation were fixed promptly but because these fixes were only ever compile tested and at some point the Mac OS X build environments changed resulting in an application that crashes when used. Despite repeatedly asking for assistance to fix the cocoa frontend over the last eighteen months no one had come forward. And when the topic was discussed amongst the developers it quickly became apparent that no one had any objections to removing the cocoa support. 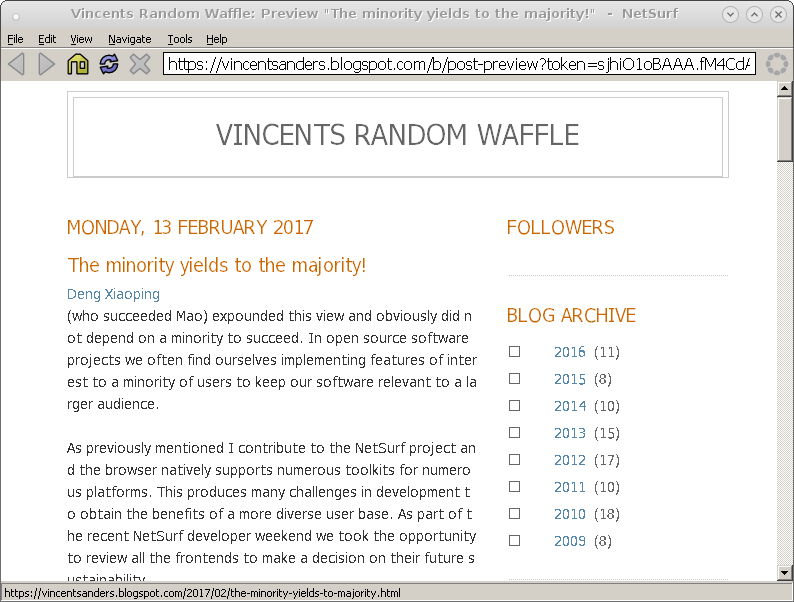 In contrast the windows frontend, which despite having many similar issues to cocoa, we decided to keep. These were almost immediate consensus on the decision, despite each individual prior to the discussion not advocating any position. This was a single example but it highlights the benefits of a disparate development team having a physical meeting from time to time. However this was not the main point I wanted to discuss, this incident highlights that supporting a feature only useful to a minority of users can have a disproportionate cost. Arguably the greatest resource of a project is the time its developers can devote to it. Unless it is a very large, well supported project like the Kernel or libreoffice almost all developer time is voluntary. Any given developer is likely to work on an area of code that interests them in preference to one that does not. This means if a developer must do work which does not interest them they may loose focus and not work on the project at all. A given developer may not have the skillset necessary to work on a feature, this is especially acute when considering minority platforms which often have very, very few skilled developers available. It should be obvious that software that only requires commodity hardware and software to develop is much cheaper than that which requires special hardware and software. To use our earlier example the cocoa frontend required an apple computer running MAC OS X to compile and test, this resource was very limited and the project only had access to two such systems via remote desktop. These systems also had to serve as CI builders and required physical system administration as they could not be virtualized. Once a project releases useful software it generally gains users outside of the developers. Supporting users consumes developer time and generally causes them to focus on things other than code that interests them. While most developers have enough pride in what they produce to fix bugs, users must always remember that the main freedom they get from OSS is they recived the code and can change it themselves, there is no requirement for a developer to do anything for them. A project requires a website, code repository, wiki, CI systems etc. which must all be paid for. Netsurf for example is fortunate to have Pepperfish look after our website hosting at favorable rates, Mythic beasts provide exceptionally good rates for the CI system virtual machine along with hardware donations (our apple macs were donated by them) and Collabora for providing physical hosting for our virtual machine server. Despite these incredibly good deals the project still spends around 200gbp (250usd) a year on overheads, these services obviously benefit the whole project including minority platforms but are generally donated by users of the more popular platforms. A feature may mean the project gets built in a new environment which reveals issues or opportunities in unconnected code. For example the Debian OS is built on a variety of hardware platforms and sometimes reveals issues in software by compiling it on big endian systems. These issues are often underlying bugs that are causing errors which are simply not observed on a little endian platform. Gaining users of the software is often a benefit and although most OSS developers are contributing for personal reasons having their work appreciated by others is often a factor. This might be seen as the other side of the support cost. In the end the maintainers of a project often have to consider all of these factors and more to arrive at a decision about a feature, especially those only useful to a minority of users. Such decisions are rarely taken lightly as they often remove another developers work and the question is often what would I think about my contributions being discarded? As a postscript, if anyone is willing to pay the costs to maintain the NetSurf cocoa frontend I have not removed the code just yet.